REPETITION IS THE KEY TO RETENSION! Banks, S&Ls, credit unions, and brokerage houses can all benefit from the power of LEDs to advertise and draw attention to their business every day. ► Draw attention and attract new customers from the branch to the corporate level, from the street to the lobby. ► Advertise new investment products, savings accounts, and checking promotions. ► Run stock / financial data with live, scrolling tickers. ► Promote current interest rates. ► Run “help wanted” ads for extra seasonal or holiday employees. ► Broadcast community involvement and local activity sponsorship. 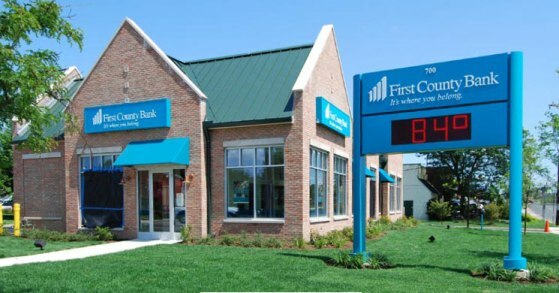 ► Display Time and Temperature – make your sign a local landmark that people look to every day! Our intuitive software also helps you get your message out and about. Easily create and manage a complete network advertising messaging, and add new excitement and traffic for your business. Potential customers are driving by your business every day – how do you effectively influence their buying habits? Replace, augment or eliminate traditional forms of costly print or broadcast advertising with instantly recognizable on-premise electronic marketing. Request your free traffic appraisal today! ► FLEXIBLE – Many modular sizes from 1.5′ tall x 5′ long to 14′ x 46′ long.